Despite redundant missions and a merely OK swing mechanic I spent many hours exploring NYC through the eyes of Peter Parker in Spider-Man 2. I’d be hard pressed to call it one of the greatest games of the last generation, but with confidence I can say it was one of the most fun. A few years later and I’m still waiting for that next great game featuring the web crawler. Shaba Games impressed me with the ideas of an all new combat system married to the fun swing mechanics of the Treyarch helmed series. Now that Activision has dropped the ball twice in recent memory, I was skeptical of Web of Shadows’ potential. First of all, Shaba Games has matched the swing mechanics of the previous game. In fact, I’d say I enjoy it a bit more. You simply hold R2 to throw out a web and swing away. If you tap it you’ll send a line out to the nearest building and “zip” yourself in any one direction, doing a mandatory mid-air Spidey twist. What works even better is Spider-Man’s reaction to walls when he hits them. Rather than clumsily thudding into the building, he’ll run along the wall, which makes moving through the city a lot more fluid. There are the occasions where you’ll hit a wall, get a weird camera angle and simple have to give up the swing. But for the most part, the hit-and-run feature works well. Speaking of wall crawling, that is the most frustrating part of traversing the world. Once on a wall you can sprint around, or web zip along. The problem is that if you’re not facing the right way and pointing the left stick in the right direction you could end up running in a direction you never intended. During almost every wall combat situation I found myself running to the ground, or around the building, or just in the exact wrong way. After hours of playing the game I came to realize it wasn’t because I couldn’t figure this mechanic out, it just doesn’t work as smoothly as the fighting and swinging mechanics. On to the battles. They hinge upon your spider-sense, which is a fancy name for a targeting system. You tap L2 to start targeting the baddies. Once done you’ll always be focused on them until they’re dispatched or you move far enough away to target someone new. This is important to remember because if you’re swinging free in the city it’s hard to control the camera with the lock-on engaged. But it’s this simple tool that makes all of the combat possible. I barely ever found myself landing on the ground to duke it out with enemies, except in the very beginning before I realized how much fun the combat system could be. 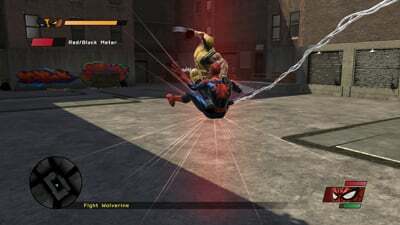 You can swing down the street, find a group of enemies, and just start using your webs and aerial combos to take them out. What results is a ballet of violence that is pure Spider-Man in every sense. Shaba Games has really gotten the acrobatic combat just right with this game. That’s not to say the game is perfect. Actually, once you step outside of analyzing the combat there are numerous problems. You’ll soon perfect your choice of combos and find that the game gets a bit boring and repetitive. This is made worse by the simple fact that the story is pretty much horrible. Along your adventure you’ll meet up with various heroes and villains that teach you new moves. The idea here is that during branching story points you have to make a decision to be good or bad, but it’s just window dressing. If you choose to work with Vulture in one point over Moon Knight, nothing of interest about what happens next changes. You just simply lose favor with Moon Knight. And because the other heroes are of little use in combat that just doesn’t matter. I’m OK with the choice to not include difficulty levels, I really am. But at no point are you challenged in Web of Shadows. It’s clearly designed so that the kiddies can make it through to the end with a little perseverance. Which would be fine if, like I said, the story wasn’t so bad. For some inexplicable reason there’s a symbiote attack on NYC. Spidey teams up with S.H.I.E.L.D. to help save the city. Along the way you meet some real C-list characters, and then Wolverine. Boss battles are almost all horrible, with special mention to the Vulture fight and Symbiote Electro. As if it wasn’t bad enough to have a silly chase-fight with Electro the first time around I have to fight him again and run around killing Symbiote pods. It’s stupid. But not as stupid as the final Venom fight, which has you battling his tendrils. What the hell? Web of Shadows is a big improvement over Friend or Foe. But Shaba Games just misses the mark by making the gameplay a little too repetitive and the story laughably silly. 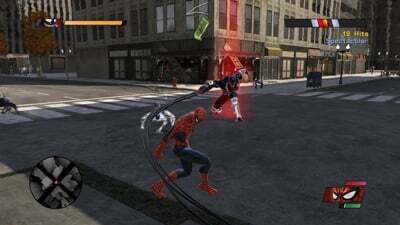 With a little more push on the overall experience there could be a great game to match Spider-Man 2 here. This time around it is just not delivered. Too bad, because I feel like they’ve finally gotten Spidey’s fighting style down. Web of Shadows is fun, but in the end is too full of flaws and ridiculous moments to be anything but a foot note in Spider-Man’s pantheon of gaming adventures.